Hello! I am officially back from holidays. What better way to get back on schedule than with a sketch. The sketch can easily be made into a one layer or a two layer card. Here's the sketch: Here are my samples. Since I was reorganizing my reinkers, I was inspired to use them. I got out the baby wipes, a bit of glossy white paper, and got to work. I took one baby wipe, cut it into 3. Next I added a few drops of reinker to the wipe and simply glided it over the white paper. I did that with each colour, then went back over at the overlapping points. 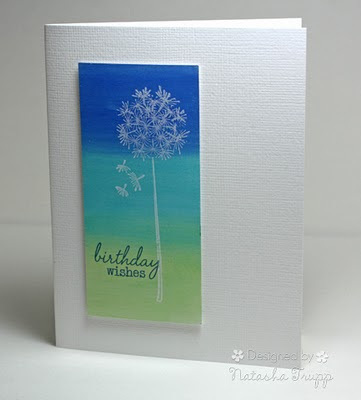 Once the swipes were dry, I stamped this delightful dandelion (by Hero Arts) over top with white pigment ink, added a greeting, then put it together on some white textured cardstock. I really like the contrast of the glossy colour with the textured white. Something I've been meaning to try, but hadn't, was the Mr. Linky widget, so hopefully this works! Leave a link to your version of the sketch! Be sure to include the link directly to your post (and not just your blog) so we can all check it out easily! Beautiful! Both of them. 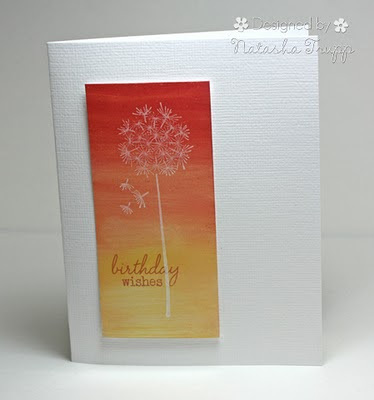 Did you use a brayer for the background color blending? I love it. YAY!! I am so FTL is back! Phew, I am so glad you're back! We have missed you & the wonderful sketches! These are awesome, worth the wait! YAY! So glad you're back, and your cards are fabulous! Wow, your cards are gorgeous! Welcome back! So glad to see the FTL sketches back - missed you over the holidays! YAY - so glad you're back on track!!! SO glad you're back! Gorgeous samples and a great sketch! I LOVE your samples! I must try that! Love it. Especially using the wipe technique. Thanks for adding the Mr Linky. So glad you're back. This is one of my favorite challenges each week! 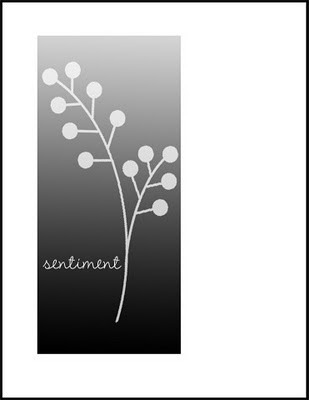 LOVE your beautiful samples with the fun technique. welcome back...fabbie sketch and inspiration! Love this sketch! This was my first time playing along and I had so much fun! Love this simplicity! Happy Stamping everyone! Love the sketch - thanks for the inspiration! Love the sketch!! Thanks for giving me the inspiration to finally get something done! I just discovered your blog and I LOVE IT! Thank you for the inspiration! Great sketch! It was fun creating a card for this. Just a question because I love your 2 cards. What white ink do you use ???? because it's perfect !!! I cans ee the details of the flower. I love the colors and the stamp you used! its so pretty.